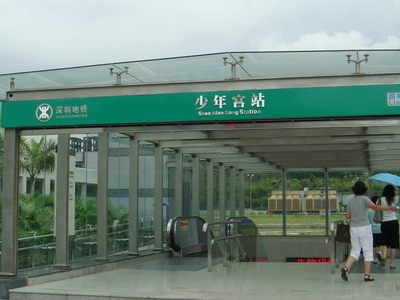 Children's Palace Station (Chinese: 少年宫站; pinyin: Shàonián Gōng Zhàn) was a terminus of the MTR Shenzhen Longhua Line. It started operations on 28 December 2004. It is located at the underground of the south of Lotus Hill (Chinese: 莲花山) in Futian District, Shenzhen, China. It is adjacent to Shenzhen Children's Palace (Chinese: 深圳少年宫). Formerly known in English by its pinyin transliteration Shaoniangong, Children's Palace was the northern terminus of the Longhua Line, before its extension to Qinghu (Chinese: 清湖站) in North Shenzhen was completed in 2010. Children's Palace is an underground station with two levels. 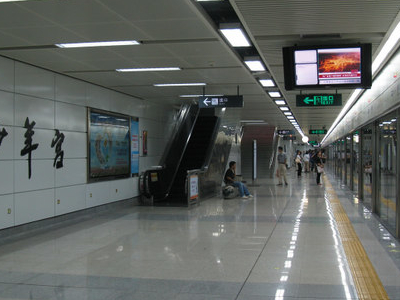 The two side platforms are located on the lower level, while the upper level being the station concourse. 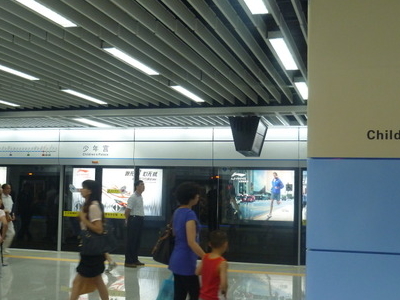 Here's the our members favorite photos of "Metro Stations near Futian". Upload your photo of Children's Palace Station!